“Anyone four years old,” Shirley Temple Black wrote, “absorbs experience like a blotter.” Anyhow, she certainly did, and her experience with the Baby Burlesks gave her plenty to soak up. She learned that making movies was business, and wasting time was wasting money — and if you wasted too much of either, you wouldn’t get any more of it. Se learned about hitting chalk marks on the floor to be properly lit. Even better than that, she found that her face was particularly sensitive to the warmth from the overhead lighting instruments, which made her good at what actors call “finding your light”; she could feel the difference between the light hitting her forehead, her cheek or her chin. The script called for her to be conducting a play tea party in the yard outside her family’s ranch house when a member of the enemy clan shoots the head off her doll, hoping to prod her father, uncles and grandfather into a showdown. Somehow, this time Gertrude was able to wangle an interview with the movie’s director, Alexander Hall. In Child Star Shirley doesn’t know how Mother did it; I wouldn’t be surprised if word of Shirley’s song-and-dance with James Dunn was already circulating on the Hollywood grapevine. In any event, Shirley auditioned for Hall personally. “No, kid! Stop! We’re finished.” It was as simple as that; Shirley had the part. 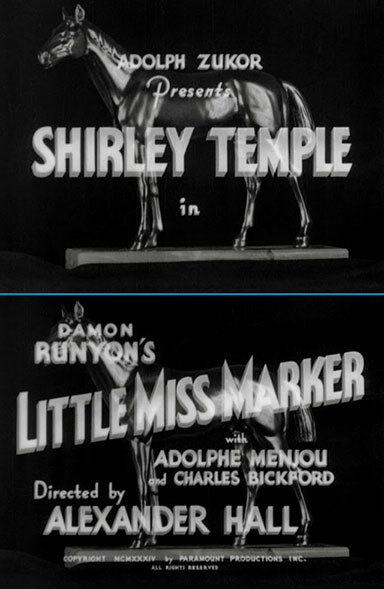 Paramount offered Fox $1,000 a week for Shirley’s services (a huge profit over the $175 in her Fox contract), and on March 1, 1934 Shirley reported for her first costume fittings for Little Miss Marker. William R. Lipman, Sam Hellman and Gladys Lehman’s script was adapted from a story by Damon Runyon about a sourpuss bookie named Sorrowful who grudgingly accepts a bettor’s small daughter as a sort of “hostage” for a two-dollar bet on a horse race. The father promises to get the money and be right back, but he never comes back. Sorrowful finds himself saddled with the little girl, whose sunny sweetness gradually thaws his heart, brightens his outlook and loosens his airtight purse strings. Everyone notices the change the tot makes in Sorrowful, and they warm to little “Marky” themselves. Damon Runyon died in 1946, but his name has stayed current in American culture thanks to the Broadway musical Guys and Dolls (its title taken from one of his story anthologies, its plot from two of his tales). But Guys and Dolls has also skewed the popular image of his stories and what it means to be “Runyonesque”. The musical is set in a rollicking fantasy land of cute underworld denizens — grifters, mugs, oafs and dames, colorful and essentially harmless. In Runyon’s stories there is humor, to be sure, but it’s not rollicking; it’s more often sardonic, even mordant, and the atmosphere of the stories, despite the picturesque speech, is hardly fantasy. The world of Runyon’s nameless narrator is gritty and down to earth, lit by bare bulbs in cheap hotel rooms and the gaudy glare of street neon; we can almost smell the cheap cigars and stale perfume. Things may work out — for the time being — for the characters, but it’s usually thanks to ironic accidents, not a benign universe. There’s often an undercurrent of menace beneath the whimsy, and bad things do happen. The movie keeps Runyon’s hospital climax — Marky is there with life-threatening injuries from falling from a horse, not pneumonia — but softens the ending: Marky lives, and Sorrowful’s reformation is allowed to stick. (The writers also gave Sorrowful a surname, Jones, which is not in the story but has stayed with him through two remakes.) Otherwise, it’s faithful to the spirit of Runyon’s story — basically a drama with small comic flourishes — with a suitable mix of seediness and vulgar glamour. Surely, Runyon was pleased. Marky’s “Lady Guinevere” is Bangles Carson (Dorothy Dell), nightclub singer and kept doll of Big Steve Halloway (Charles Bickford). Bickford, of course, was in the early stages of a long and distinguished career. Dell might have been, too; she was only 19 when she made Little Miss Marker, her second picture, with a husky contralto voice and a wise way with a good line. She too had a strong rapport with Shirley, only this time it extended to off-camera, where she was as much a big sister to her as Bangles is to Marky. Dorothy Dell might have become Paramount’s answer to Alice Faye, Joan Blondell or Jean Harlow. Alas, when this scene of Bangles singing Marky to sleep was shot, Dell had only three months to live. Early in the morning of June 8, 1934, she was returning from a party in Altadena with a friend, Dr. Carl Wagner. On a deceptively sharp curve on Lincoln Avenue in Pasadena, Wagner lost control. The car hit a rock, then, flipping end over end, a light pole and a palm tree. Dorothy was killed instantly, crushed in the mangled wreck. Wagner was thrown clear but died six hours later without regaining consciousness. Shirley was back at Paramount then, making another loan-out (Now and Forever); the studio staff kept the news from her as long as they could. Little Miss Marker fleshed out and in many ways improved Runyon’s original story. The amnesiac-father angle was always a bit of a credulity stretch; in the movie he becomes a suicide — driven off the end of his rope when the bet he placed with Sorrowful turns out a loser. This heightens Sorrowful’s sense of obligation to Marky: the race was rigged and he knew it when he took the man’s bet. It also links Marky to that losing horse, the ironically named Dream Prince. When Big Steve, Dream Prince’s owner, is suspended over suspicions about that fixed race, Steve and Sorrowful set Marky up as Dream Prince’s dummy owner so the horse can continue to run. Marky’s affection for “the Charger” (another one of her fanciful King Arthur names) draws her, Sorrowful and Bangles closer together, and leads to a crisis when Big Steve gets wind of shenanigans behind his back. Little Miss Marker was a smash hit. With it Shirley Temple truly arrived, and it remains one of her best pictures with one of her best performances. It proved that her show-stopper in Stand Up and Cheer! was no fluke, that she could handle the central role in a major feature and hold her own with a castful of seasoned professionals. Just look at her billing in the picture’s opening credits: her name alone, before the title and just as big — bigger in fact than Menjou, Bickford, Runyon, even director Alexander Hall. Runyon’s story would be filmed again over the years, going from good (Sorrowful Jones  with Bob Hope) to bad (40 Pounds of Trouble [’62] with Tony Curtis) to awful (Little Miss Marker [’80] with Walter Matthau). In every single one, the little girl playing Marky made absolutely no impression whatever. Can you even name them? (If you said Mary Jane Saunders, Claire Wilcox and Sara Stimson, move to the head of the Trivia Seminar.) Marky is Shirley Temple’s role for as long as movies live. And how the boys at Paramount must have crowed over that “Adolph Zukor Presents” line; take that, Fox! If you don’t know what to do with Shirley Temple, stand aside. (Paramount did in fact offer to buy Shirley’s contract for $50,000 outright. Fox declined.) Besides “announcing” Shirley and making her a real star, Little Miss Marker served notice to the geniuses over at Fox that they’d better get off their duffs and come up with something better than that miserable walk-on in Change of Heart. Luckily for Fox, they didn’t waste any more time; they put Shirley in a flurry of tailor-made pictures that are all but unique in the first year of any newborn star — a concentrated series of hits so impossible to ignore that it would spur the Academy of Motion Picture Arts and Sciences, unsure what else to do, to invent a brand new award category just for her. I'm loving this!! It's been a while since I've watched any Temple films so I'd kind of forgotten how much I loved them. My mom, who you will remember was a dancer and dance teacher, used to wax rhapsodic about Shirley's talent- especially how well she navigated those stairs with Bill Robinson – and many of the tap steps I learned and have used over the years were ones that Shirley performed. Can't wait for the next installment. I find it incredible that Shirley was originally rejected for "Marky". The movie works on so many levels for its dialogue, its heart and its outstanding cast. 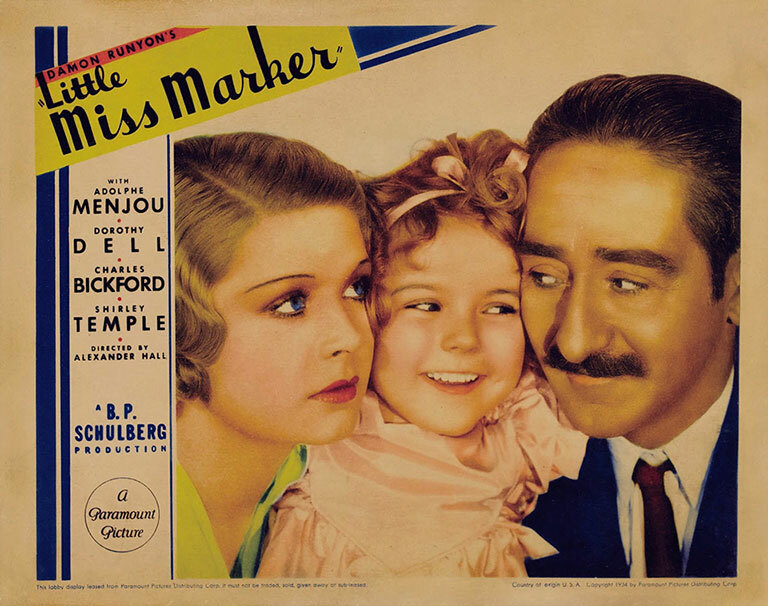 "Little Miss Marker" is always the first movie that comes to mind when I hear the name, Shirley Temple. Oh, how we would have loved the chance to enjoy more from Dorothy Dell. Jean: I'm with you; I cherished a lifelong affection for Shirley while going decades without seeing most of her movies. Re-seeing them has been a real voyage of rediscovery, which I'm sharing in this series. I think your mother would be pleased with what I'll have to say about Shirley and Bill Robinson when I get to them.